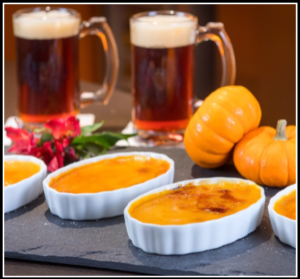 Image of Pumpkin Ale Crème Brulee taken for the Beer Institute. Recipe was created by Chef Laurent Aubel. Place cream in a medium saucepan over medium heat, bring to a boil. Remove from heat and allow to cool for 5-10 minutes. Add in pumpkin puree and pumpkin ale. In a separate bowl, whisk yolks and sugar together until well-blended. Gradually whisk in the pumpkin mixture, stirring continuously. Strain mixture if necessary into a separate bowl, pour mixture into six 3/4-cup custard cups or ramakins. Cover each ramakin with foil. Place cups in baking pan. Add hot water to pan to come halfway up the sides of the cups. Bake about 55 minutes until custards are set. Remove from water. Remove foil. Chill custards until cold. When ready to use, sprinkle sugar evenly on top of custard. Use a torch to caramelize the sugar until it forms a crispy top. Allow crème brulee to sit for 2-3 minutes before serving.